Most business processes begin with a form. W-4s, nondisclosure agreements and bills of sale are a few common precursors to the most routine tasks of an enterprise. That said, it’s best to avoid launching processes with a lengthy, repetitive list of questions. Here are four tips to keep electronic forms short, sweet and to the point. Is this form too long? Does this form request information provided in another form? For instance, requiring clients to separately sign master service, scope of work and non-disclosure agreements might not be the most efficient use of their time. These contracts could contain overlapping terms that can be streamlined to expedite the signing process. Meeting with a staff member who commonly processes your organization’s electronic forms can be a useful way to determine if you’re requesting redundant information. “I’ve already provided this information!” Prefilling electronic form fields saves time and ensures you never hear this complaint from users. Once the user enters a unique identifier in a field, certain electronic forms populate additional fields with information tied to the identifier. For instance, entering a student ID number in a financial aid form can trigger a database lookup that automatically fills in the name, address, phone number and other contact information for that student. Once that data is prefilled, the student would only need to provide new information such as the amount of financial aid and the intended use of the funds. Limiting the viewable sections of a form is another useful way to streamline electronic form completion. 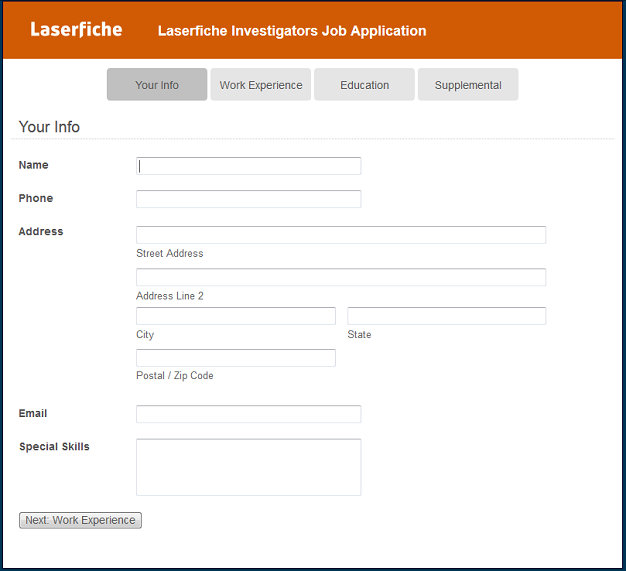 Laserfiche Forms allows certain areas of a form to be displayed based on the criteria met by the user. For example, if a job application contains a section inquiring about a person’s driving record, the employer might want to display that area of the form only to those applying for driving positions. Similarly, onboarding forms for research and development roles might include non-disclosure language that is omitted for other positions. Completing a job application with your contact information, work experience, educational background and supplemental information can be overwhelming. The hopeful candidate takes one look at the document and expects a lengthy process ahead. Dividing a form’s various sections into separate tabs helps to organize it and make it appear less daunting to the user. Rather than scrolling through a vast, question-filled document, the user selects from an organized row of application sections at the top of the screen. See this article for more information on configuring form tabs. 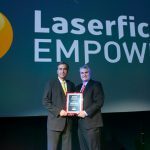 To learn more about improving your organization’s electronic forms, download the free guide: Quicker Better Safer: Laserfiche Forms.